James Regor "Jim" FLOYD [Parents] was born on 10 Jul 1860 in Brewer, Pike, Arkansas. He was christened in Church of Christ. He died on 22 Feb 1942 in Ada, Pontotoc, Oklahoma. He was buried on 22 Feb 1942 in Rosedale Cemetery, Ada, Pontotoc, Oklahoma. James married May. May was born on 16 Apr 1891. She died on 2 Sep 1929 in Ada, Pontotoc, Oklahoma. 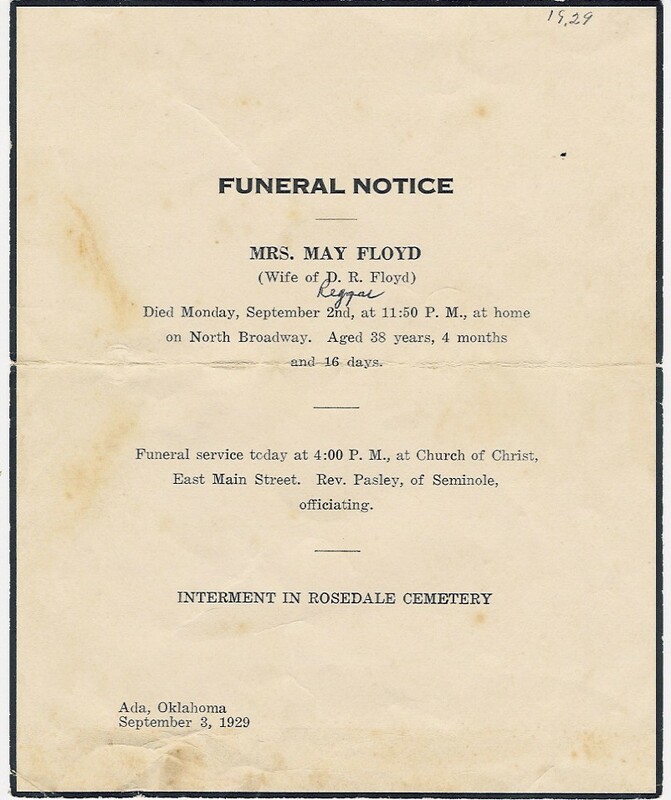 She was buried on 3 Sep 1929 in Ada, Pontotoc, Oklahoma. 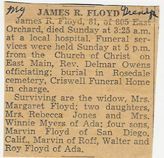 May married James Regor "Jim" FLOYD. John Harrison DRUERY was born on 15 Feb 1831 in East Butterwick, Linconshire, England. He died on 15 Jun 1996 in Nemaha, Gage, Nebraska. John married Sarah Celia WILSON. Sarah Celia WILSON was born on 1 Jun 1850 in Chicago, Cook, Illinois. She died on 6 Oct 1924 in Shubert, Richardson, Nebraksa. Sarah married John Harrison DRUERY. Helen M. "Goldie" DRUERY was born on 25 Dec 1865 in Sterling, Johnson, Nebraska. She died on 27 Mar 1952 in , , Colorado. M ii Harrison Wilson DRUERY was born on 24 Sep 1866. He died on 13 Feb 1932. KIMBROUGH. KIMBROUGH married Jane Morrison KIMBROUGH. Jane Morrison KIMBROUGH was born on 5 Oct 1801 in , Hardin, Kentucky. She died on 3 Jun 1875 in , Edgar, Illinois. She was buried in Sims Cemetery, , Edgar, Illinois. Jane married KIMBROUGH. Bud CARDONA. Bud married Rhonda HOLLINGSWORTH. The marriage ended in divorce. Rhonda HOLLINGSWORTH [Parents]. Rhonda married Bud CARDONA. The marriage ended in divorce. Williard Carl COOPER "Jr" [Parents] was born on 31 May 1926 in Cameron, Milam, Texas. Williard married Eula Margaret ROUSE. Eula Margaret ROUSE was born on 17 Mar 1927. She died on 22 Dec 1981 in Austin, Travis, Texas. Eula married Williard Carl COOPER "Jr". M i Russell Allen COOPER. M ii Curtis Lloyd COOPER. Earl Alexander RICE [Parents] was born on 11 Mar 1902 in , Brown, Texas. He died in Jul 1979 in Cisco, Eastland, Texas. He was buried in Cisco, Eastland, Texas. Earl married Zelma Opal BOWDEN on 24 Feb 1924 in , Brown, Texas. Zelma Opal BOWDEN was born on 22 Sep 1902 in , Brown, Texas. She died on 7 Jan 1988 in Fort Worth, Tarrent, Texas. Zelma married Earl Alexander RICE on 24 Feb 1924 in , Brown, Texas. F i Sunshine Collene RICE was born about 1929. F ii Opal Earline RICE was born on 15 Apr 1930. M iii Virgil Charles RICE was born on 15 Dec 1932. He died on 9 May 1991. Jack DODD. Jack married Opal Earline RICE. Opal Earline RICE [Parents] was born on 15 Apr 1930 in May, Brown, Texas. Opal married Jack DODD. Eugene Vernon "Gene" WILLETT was born about 1926. Eugene married Sunshine Collene RICE. Sunshine Collene RICE [Parents] was born about 1929. Sunshine married Eugene Vernon "Gene" WILLETT. F i Reena Jean WILLETT. F ii Tammy June WILLETT. Earl Alexander RICE [Parents] was born on 11 Mar 1902 in , Brown, Texas. He died in Jul 1979 in Cisco, Eastland, Texas. He was buried in Cisco, Eastland, Texas. Earl married Mildred Loretta EARNEY on 12 Feb 1938. Mildred Loretta EARNEY was born on 18 Apr 1915 in , , Texas. She died on 8 Jun 1988 in Cisco, Eastland, Texas. She was buried in Cisco, Eastland, Texas. Mildred married Earl Alexander RICE on 12 Feb 1938. F i Emily RICE was born in 1938. F ii Gaytha Gail RICE was born about 1940. M iv William Earl "Bill" RICE "Sr". William Davis WALKER was born on 14 Aug 1886 in Salma, Autauga, Alabama. He died on 23 Mar 1963 in Wortham, Freestone, Texas. William married Margaret Mae BROWN on 17 Dec 1922. Margaret Mae BROWN [Parents] was born on 6 Jun 1905 in Bokchito, Bryan, Oklahoma. She died on 7 Jan 2001 in Conchas Dam, San Migual, New Mexico. Margaret married William Davis WALKER on 17 Dec 1922. F i Mary Ann WALKER was born on 20 Jun 1924. She died on 7 Jul 2001. M ii James Watt WALKER was born on 14 Feb 1926. He died on 17 Apr 1982. F iii Alta Lynn WALKER was born on 9 Aug 1928. F iv Barbara Jean WALKER was born on 1 Jan 1931.